Gorgeous Semi-Detached W/4Bdrm,4Bath In Meadowvale Village!Double Door Entrance To Welcoming Foyer!Open Concept Living,Dining! 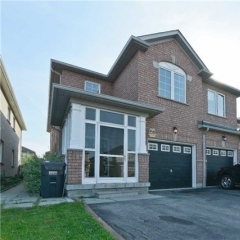 Fully Upgraded Home W/Stunning Kitchen-Quartz Counter,Glass Backsplash,Pot Lights!Combd W/Breakfast!Cozy Family Rm!Mstr Br W/Walk In Closet,Ensuite W/Upgraded Vanity!Spacious Bedrms,Freshly Painted Home!Finished Basement Apartment W/Separate Entrance!Close To Derry West Pub,St.Marcellinus&Mississauga Ss!Minute To Hwy 407. Includes: S/S Stove, S/S Fridge, S/S Dishwasher, Washer, Dryer, All Elf's, Cac, Gdo+Remotes.Minute To Public Transit, Heartland Shopping Center, All Essential Amenities*Close To Meadowvale Go Station! Shows Like A Model Home!